Last month Mike Petters, president and CEO of Huntington Ingalls Industries (NYSE:HII), was honored by the Coast Guard Foundation at the 35th Annual Salute to the United States Coast Guard, held in New York City. 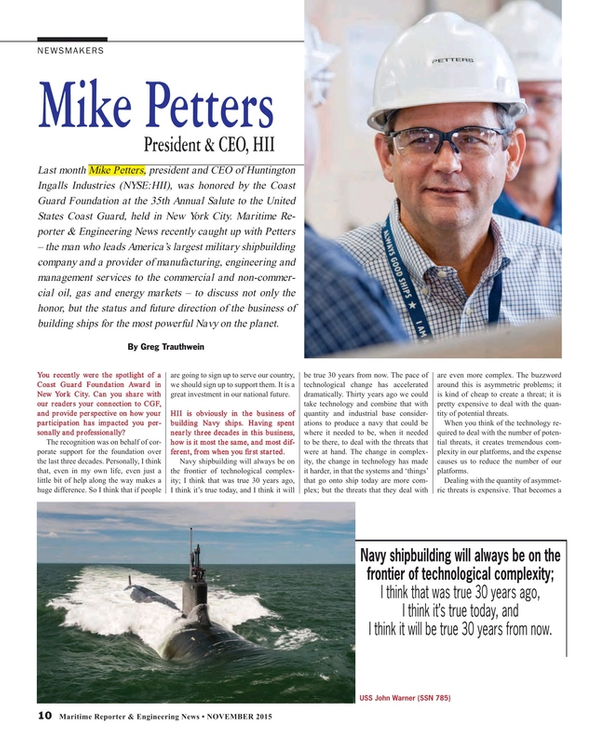 Maritime Reporter & Engineering News recently caught up with Petters – the man who leads America’s largest military shipbuilding company and a provider of manufacturing, engineering and management services to the commercial and non-commercial oil, gas and energy markets – to discuss not only the honor, but the status and future direction of the business of building ships for the most powerful Navy on the planet. You recently were the spotlight of a Coast Guard Foundation Award in New York City. Can you share with our readers your connection to CGF, and provide perspective on how your participation has impacted you personally and professionally? The recognition was on behalf of corporate support for the foundation over the last three decades. Personally, I think that, even in my own life, even just a little bit of help along the way makes a huge difference. So I think that if people are going to sign up to serve our country, we should sign up to support them. It is a great investment in our national future. HII is obviously in the business of building Navy ships. Having spent nearly three decades in this business, how is it most the same, and most different, from when you first started. Navy shipbuilding will always be on the frontier of technological complexity; I think that was true 30 years ago, I think it’s true today, and I think it will be true 30 years from now. The pace of technological change has accelerated dramatically. Thirty years ago we could take technology and combine that with quantity and industrial base considerations to produce a navy that could be where it needed to be, when it needed to be there, to deal with the threats that were at hand. The change in complexity, the change in technology has made it harder, in that the systems and ‘things’ that go onto ship today are more complex; but the threats that they deal with are even more complex. The buzzword around this is asymmetric problems; it is kind of cheap to create a threat; it is pretty expensive to deal with the quantity of potential threats. When you think of the technology required to deal with the number of potential threats, it creates tremendous complexity in our platforms, and the expense causes us to reduce the number of our platforms. Dealing with the quantity of asymmetric threats is expensive. That becomes a real challenge, because in shipbuilding, the more repetitive we can be, the more we can move toward series production, the more we can make the next ship look like the last one, the better we can invest and the better our customers like it. .
You lead an industrial organization in a country that many would argue has lost its industrial prowess. In your mind, what is the key to HII’s success? Every successful business starts with your people. We have nearly 40,000 employees around the world, and our primary assumption is that every day that they come to work, they want to do a good job. The challenge is to enable that. Whether it’s with tools and equipment, or its with training, or sequencing or planning … it’s all about making sure your people have their best chance to do their best work. If you’re able to that, you will be successful; if you’re not able to do that, you’re not going to last very long. Navy business, like many others, are cyclical. What is the secret to staying efficient as demands rise, fall and change? There are two parts. The first is customer intimacy; you’ve got to have a good sense of the challenges you customer has, and know the options your customer has to deal with those challenges. You are always learning. I was in the Navy and I’ve been in shipbuilding for 28 years, and I learn something new every day. I think it is critical that you continue to refresh your perspective on your customer and their challenges. The second part is asking: do you really know where technology is taking the processes that you use? How well do you understand that; how well can you lead that, so that you can create those technologies and processes that ultimately our customer will need to deal with their challenges. You’ve got to do both: you’ve got to be really close to your customer and understand what is driving them, and you’ve got to understand your craft, today and tomorrow. If you had to identify the one technology that has most enabled efficiencies in your business, what would that one technology be? Our ability to process data has become both our greatest tool and our biggest challenge. Decades ago, if we wanted to have a system on a ship to fight a fire, we would have a pump and a hose and a sailor. Today, we still have the pump, but instead of a hose we’ll have sprinklers. Instead of the sailor we have 2,000 electrical signals coming in from around the ship to a processor to let a computer know whether or not to turn on the fire suppression system. That’s an opportunity to improve the performance of the ship and help our sailors focus on the higher end part of being in the Navy. But it’s also a challenge of building and integrating that type of system. The management of information cuts both ways. We are blessed to support this great country. One of our shipbuilders once said … ‘we build our ships so that when our sailors go overseas that they’re never going to be in a fair fight.’ When people see our platforms coming over the horizon, they see America at its very best. It’s great to have a very small part in sustaining that for four decades to come. I’m looking out my window at the Gerald R. Ford, which will be making history for the next 50 years. It will be a very important part of how the world evolves over the next 50 years, and frankly, that’s pretty exciting. Conversely, what do you find most frustrating? We just talked about a ship that will be making history for the next 50 years, but as a society I think we are falling into the trap of not thinking very long term. For me, it’s challenging to deal with institutions that can’t see past next week, next month, next quarter or next year when we are thinking about five decades from now. The hardest part for me is impressing on folks that real leadership in our country requires people to take a longer view. Every business has its challenges. What are yours? We are investing heavily in our shipbuilding enterprise to set the stage for the next 25 years. I call it a generational investment in shipbuilding, to transform both our nuclear and non-nuclear shipbuilding enterprises. At Ingalls we’re investing in facilities and process flow to reorient that yard toward the products we see that the Navy is going to need over the next 30 years. At Newport News, we are investing as we come through the building of Ford. One of the challenges of shipbuilding is that we build our prototype as our first production unit, so the Ford is the lead ship and the prototype. We have learned a lot on that program and now we can invest in areas of our yard that will drive efficiencies when building the remaining ships of the Ford class.